Yesterday President Barak Obama enlisted some help from Harold (John Cho) and Kumar (Kal Penn) in a video hyping the Democratic National Convention. 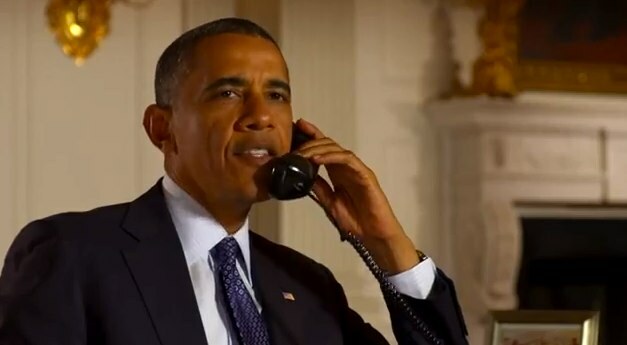 In the video, Obama can be seen making a call and saying, "Hey, this is Barack. Listen, I need to know if you're on board. Cause I'm counting on you. Everybody is. We have to get this right. So there's a lot at stake here. Just remember that I'm trusting you on this, and I'll see you then." The scene then shifts to Cho and Penn sitting on a couch, eating junk food and watching TV. A voiceover at the end promotes Penn as host of convention coverage which begins September 6 in Charlotte, NC. We suppose presidents today have to do whatever they can to reach the public but enlisting a couple of stoner characters to hype viewership for a presidential convention seems to devalue what should be a moment of supreme political importance.